This Page: Sarah's Parents | Einhorn grandparents | The Kassarichs come to America | When was Sarah born? Originally recorded by Max Buten from Sarah 2000-10-29 to 2001-05-14. 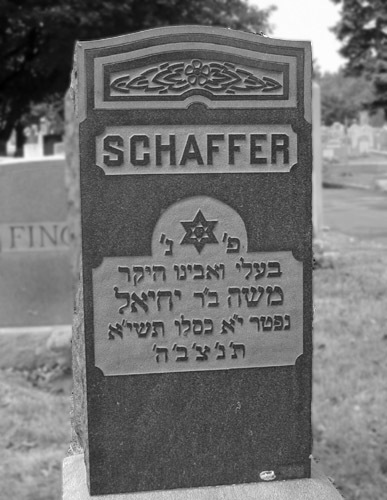 Shifra, the oldest child, brought Nathan and his family to America, where they first lived in her garret at 5th and Nobel. She and her husband Oskel Plone had 2 sons and 2 daughters; later they all moved to San Bernardino. The children were Sonya (who was divorced from Hassah (Oscar) because they couldn't have children), Yanni (Sammy), Shri Laib, and Essie (Esther), the youngest. He worked as a presser at the Reinish manufacturing plant at 8th and Filbert. 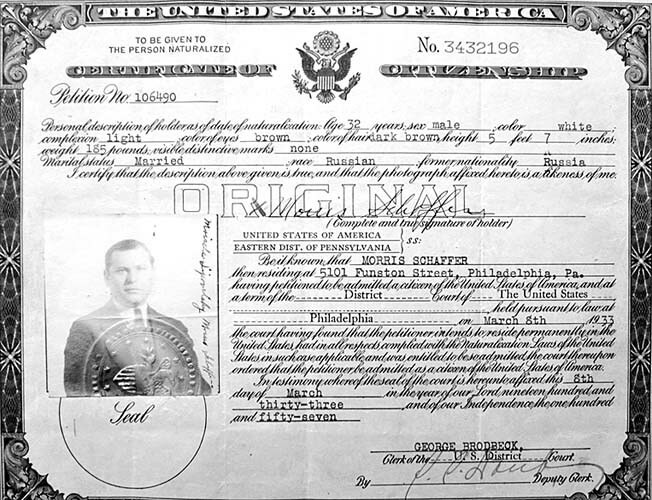 (The 1910 Census says he was a self- employed "ironer" for "S.Suit co.") During the First World War, they made duffel bags. Nathan was in charge of the machine that put drawstrings in the duffel bags. One day Nathan came home at lunchtime and told Sarah to go to work at Reinish. Sarah was too upset to eat her lunch. Nathan died January 7, 1942, at 72, when Gloria was in about 6th grade six. Laib traveled; Sarah doesn't know any more about his occupation. As the head of the family, he could be cranky. Bathsheba could read and write Russian and Yiddish. They lived in Lyubar, in Volhyna Gobernia (county) in Russia, (near Odessa, according to Sarah) in what is now the Ukraine. Lyubar is a small town at 49(55'N, 27(45'E, 127 miles wsw of Kiev, 11 1/2 miles from Ostropol'. (See map and photo which includes both Lyubar and Ostropol'). They lived on a hillside, with entrances on two floors, like our house on Fairview Road. In the business floor of the house, cousin Pessel ran a tavern for the coZAKS (Cossacks), while Bathsheba had a grocery store. 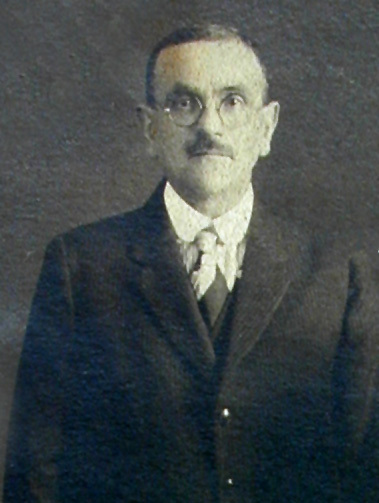 Sam Einhorn [born 1889. At 5 his mother died.] He didn't like his stepmother, and left Russia alone [at 16, coming to the US around 1905.] Later, he was crippled [out of work for a year] after falling into a car pit at the PRT (Philadelphia Rapid Transit, now SEPTA). Pessel (Betsy): Went to Argentina but didn't like it. Returned and "was killed by the Gestapo." Her son Bensie went to Argentina. Her son Yaisey shot himself but was treated at (Hahnneman?) Hospital. After he recovered, he went to England to join the army. On the way, his ship was wrecked. He survived and eventually returned to Philadelphia, where he married a Wortzel, whose family lived at 7th and Parrish. Yaisey was so nearsighted that Sarah remembers him walking into a door on the train. Daughter Shprintzie, like her cousin, went to Argentina. Son Jake Graff, who once took Sarah to the opera, to see "Ave Maria" near Broad & Spring Garden. Later he went to London, Ontario, Canada to dodge the draft, where he married. His wife died in childbirth. He did well there, visiting Florida frequently. Ben Kassarich once visited him in Canada. Rebecca (Bathsheba) followed her husband directly to Philadelphia, with their first 3 children, Sarah, Itzhak (Issie), and the baby, Ben. According to the 1910 Census, he came in 1906, while she followed the next year, when Sarah was 7. They also brought a feather bed (later converted to pillows), fancy dresses (a black velvet outfit, and a beige one), silver cups, and the samovar which we have. Sarah remembers hiding when they crossed the border; also her mother buying bologna from a stand in the train station. Sarah also remembers Anzie, the Russian girl who took care of her and her brothers. Sarah knows a few words of Russian, such as blutta, mad. 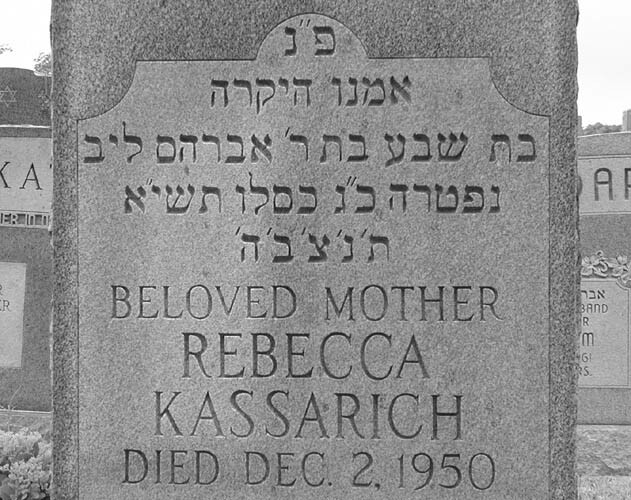 Rebecca (Bathsheba in Hebrew) died December 2, 1950, two weeks after her son-in-law, Maurice. 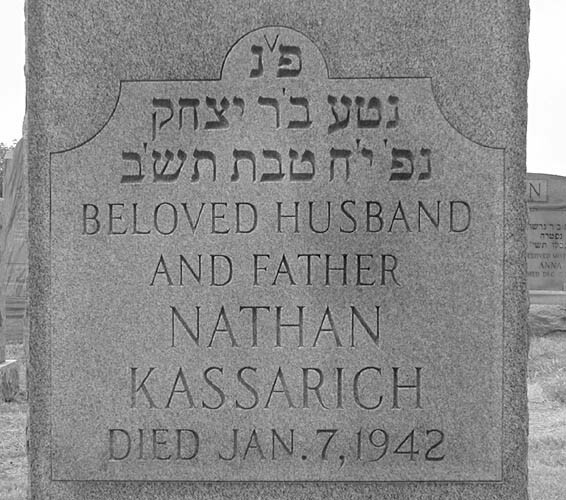 Nathan and Rebecca Kassarich are buried in Montefiore cemetery, on Goldstein Ave, thru the gate for Ezras Achim Brisker Lodge, on the second row, the 5th stone. It's lot M485. Sarah went to the Paxson school at 5th & Noble Sts. Miss Emminger, her first teacher, assigned her to the seat in front, with no desk. Other teachers included Miss Karr, Mr Anderson, Miss Stern, and for 5th grade, Miss Sloane. One of them complemented Sarah on her pink dress - it was really a white dress, but some red color had run onto it in the wash.
Issie married Reba Griswold, whose mother was Rumanian and father was Russian. Issie worked at Stetson Hats until he was injured in an elevator accident there. Reba's sister, Katie, had three children: Harriet, Pearl (who sang with Mish Buten in the Temple Adath Israel choir), and a chiropodist son. Issie and Reba had two sons, Jack Kassarich and Lou Kassin. Lou practiced law with his uncle, Lou Kassarich. Ben, who unofficially shortened his name to Kass because he thought "Benjamin Kassarich" was too long a signature, married Esther Hassan (d. 2004). Their children are Merle (married 3 times - now to Max Raab, no children) and Lenore (married twice, now to Michael Scharf). Lenore and Michael, who live in Bethlehem, PA, have two daughters: Lisa and husband Robert Mintz live in Denver, where they have two children, Molly and Noah. Jill and husband Gary Brandeis, in Villanova, also have two children, Hope and David. Lou Kassarich was born here. Lou lived with his mother until she died - rent free and taking free food from Maurice even while he was a practicing lawyer. He married Flora Krischeff, who later divorced Lou and married Mr. Glass. Lou and Flora had two children, Richard and Barbara. Barbara is named after Rebecca (Bathsheba) - her Hebrew name is Shiva. Officially, April 16, 1900. Of course, there are no papers from Ostropol' or Lyubar to prove or disprove this. When she was 99, Sarah decided that she or her parents had added two years to her age so that she could work. Presumably this was during World War I, when she went to work at Reinish. As corroboration, Sarah says she was 16 at the time of the flu epidemic in October 1918, which would mean that she was born in 1902. The 1910 Census for 343 N. 6th St. says that Sarah was 10 years old, "Isadore" was 8, and "Bennie" was 4. (See details on another page.) This would mean that she was born in 1900, and may be the source for the official date. How about the date of April 16? Sarah remembers it as "the second day of Passover," which is Nisan 17, 5660 or 5662. In 1900, that would have been April 15 or 16, and in 1902, April 23 or 24 (depending on which calendar program I use). But in Russia, they used the Julian calendar at that time, which would make her birthday Apr 3, 1900 or Apr 11, 1902. Maurice's father - Sarah has no information. Maurice's gravestone says his father's name was Yechiel. Maurice & Sarah's marriage license says his name was William. Sarah's version: His mother, Rifka, married young. She had a daughter, who disappeared, and Maurice. 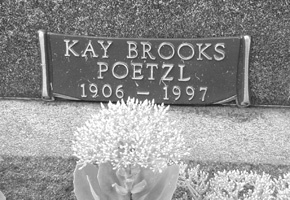 After her husband died, she married Zeebooker, who changed his name to Brooks. Their children were Kay and Lew. Kay met Frank Poetzl when she worked at the Trenton Hotel where he was maitre'd. Presumably this was when the family was living in Newark, where Lew met his wife, Bert. On Maurice & Sarah's marriage license, she's Rebecca, maiden name Raivy, a housewife living with Maurice. 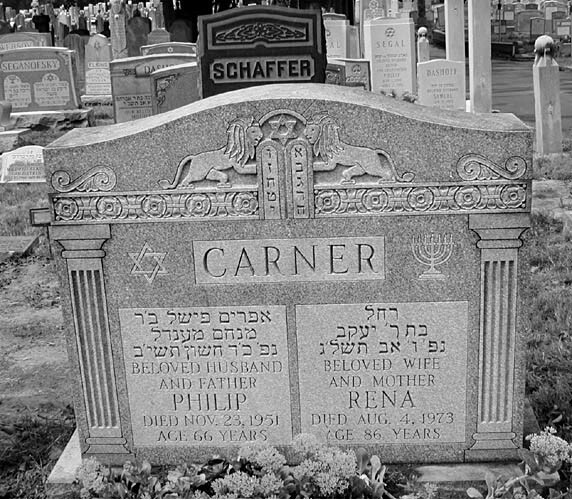 Her grave in Montefiore says she died October 3, 1931, age 56. On the stone, she's Rebecca Schaffer-Brooks, with Hebrew name Rebecca Rachel, daughter of Moshe. Bert Brooks' version: Rivka married young to a man she despised; they had a daughter. Rivka wanted to divorce her husband. He agreed to the divorce only on the condition that he get custody of the daughter. Later ex-husband and daughter were killed in a pogrom. She then married Lipovetsky and had Maurice (who later changed his name to Schaffer). Her second husband also died in Europe. Her third marriage was to Ellie (Eliyahu) Zebooker, a widower with three teenage children (Fanny, George, and Ben). After Kay was born in Byelosvetgrad, Ukraine, they came to America. Here Rivka had a boy, Lewis (Laib) and within the year became a widow once more. Ben, and then the other Zebookers, changed their name to Brooks. The oldest three were born in Russia; Lew in the U.S. The Brooks Family lived at 5441 Arlington St. in Wynnefield. Lew and Bert were married in Newark in 1931. Lew died in January 1957, age 47. Jake Suckno and his brothers took the name"Suckno" in Ellis Island on arriving here from Poland. 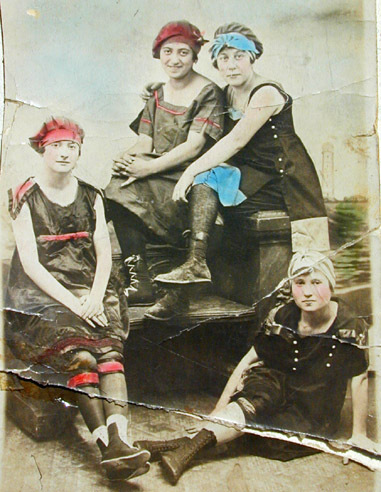 The family name in Poland was "Kechuba" (spelling unknown) "Suckno" is the Polish word for "pants tailor" the family occupation there. Brother Michael (Mickey) Sherman (whose wife, the former Edith Cohen, is Tova Brooks' cousin). Their children are Rene and Karen. Mickey, named "Sherman Michael Suckno" at birth, changed it to Michael Sherman when he saw that he was not to have a male heir. Lauren, at casino in A.C.
Susan (m2 Howard Drucker) - He's an accountant who runs bankrupt businesses for their creditors. Daughter Rhoda Billingsley - lives in Rome, where husband Hugh Michael Billingsley is a sound editor for Italian movies (and was Mario in Ben-Hur). Rhoda has published several translations of art books into English. They have four daughters. From Alexis Rzewski in 2008: "one of the four daughters is named Carla, and she attended a public high school in downtown Rome, Italy, called 'Liceo Virgilio' in the years 1977-82, and also attended summer camp in Olbia, Sardinia, organized by YMCA Italy." Daughter Joyce Poetzl - never married, worked for Singer Aerospace in Washington, died about 1999. 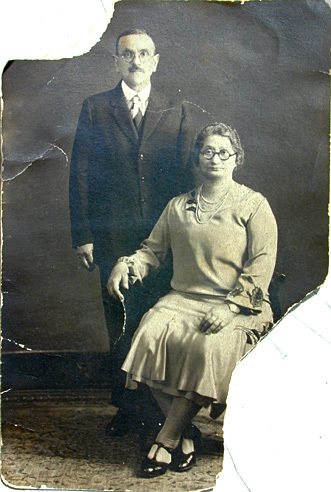 Jake's son, Abe Ravi, married Dora. Their daughters were Harriet and Kitty (for Katherine?). Abe had a luncheonette at 10th & Chestnut, across from the electric company. He was a gambler. Maurice loaned Abe $3000, but lost it all. Maurice and Sarah spent their wedding night in the Ravi apartment, above the luncheonette. Naomi first married Dr David Gelfand, who lived on Pine St behind Max and Gloria's house at 1721 Addison St. (One of the Zebookers lived around the corner on 17th above Pine. Max never met that Zeebooker nor Dr Gelfand.) She divorced when Marcia was small and married David Rose. She lived in Buckingham, Bucks County, with her bearded second husband until her death about 1992. Naomi's daughter with Gelfand is Marcia Rose Emery. Marcia, a PhD in Psychology, has written several books on intuition. She lives with her husband Jim in Berkley, CA. Here's more. Rena Carner had a bathhouse at 6th & Lombard, and a house nearby on Pine St. She hosted Maurice and Sarah's wedding party. Later, when this section became part of the Society Hill renaissance, Naomi sold both buildings, moved Rena into an apartment in the northeast, and used the rest of the money to buy a nice house "in Doylestown". There was another sister, Lizzie (Mrs. Samuel) Verbit. When Sam Einhorn's cousin [sister] Slata (whose husband was related to Philip Carner) was visiting the Kassarichs, she met Sarah, who was with a date. Slata sent her cousin Rena Carner, Maurice's first cousin, to look Sarah over. 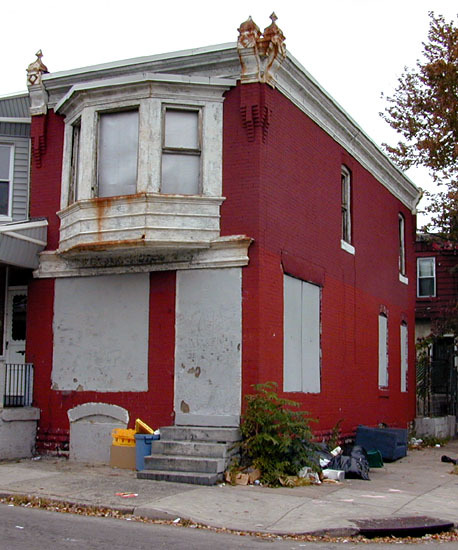 Maurice's family had recently moved to Ridgwood Ave. in Newark, to break up Maurice's romance with a nurse. Apparently Rena liked what she saw, since she arranged to bring Maurice to dinner with Sarah's family on New Year's Day. The Kassarich family lived at 29th & Dauphin, with a dining room and kitchen behind their grocery store. Sarah was out late at a New Year's Eve party at Sarah Greenfield's house and planned to sleep all New Year's Day, but her family got her up for this dinner. Sarah came down to a good chicken dinner, and was smitten. On their first date, Maurice gave Sarah a box of Whitman's Sampler. 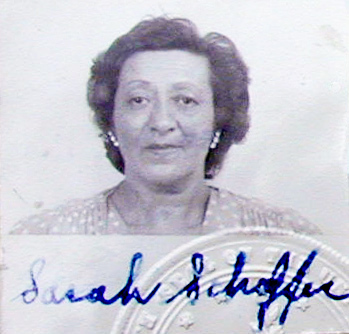 Maurice's letters to Sarah are addressed to "Sally" and signed "Maurice Schaffer." 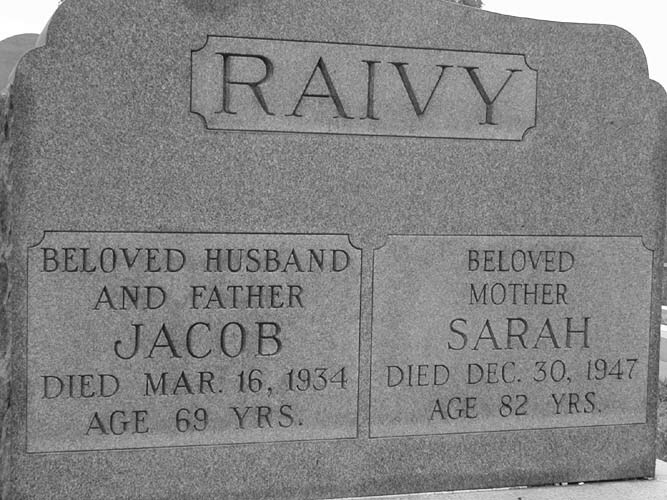 They were engaged at Easter, and married on September 7th 1930. 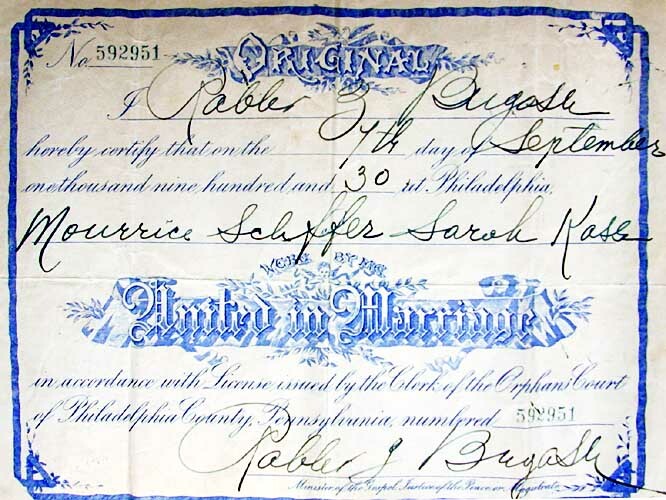 The certificate signed by Rabbi Z Bugash says that on September 7th, 1930 he married Mourrice Schffer and Sarah Kass. Philadelphia marriage license no. 592951 issued 2 Sep 1930 says Maurice, 35, a grocer, lived at 5101 Funston St, while Sarah Kass (! ), 25 (! ), a forelady (! ), lived at 2917 W. Dauphin St.
Maurice had $2000; he used $200 of it to buy a ring - under 1 carat. After one night at the Ravi apartment, they honeymooned at a boarding house in Atlantic City that belonged to the mother of Lew Brooks' friend from Atlantic City days, Abe(?) Mandell. Maurice's mother gave her apartment to her daughter Kay and Kay's husband Frank and lived alternately with each of her children, though she only lived a short while after Maurice and Sarah were married. They lived at 5101 Funston St (51st & Brown), where Maurice had a store. Sarah cleaned and washed, but her mother in law cooked when she was there. Maurice's mother had a store next to a drug store at Delaware Ave & Pacific in Atlantic City, where Maurice was a lifeguard one summer. When Gloria was born, Maurice decided that they needed a bigger place, which he could afford since he "had a few thousand." Mr. Cohen, the wholesaler's salesman, recommended a store at 2900 S. 62nd St. Maurice got up early to see how many customers went in the store. Apparently he was satisfied, so they moved when Gloria was a year old. Sarah's brother, Issie, took over the store on Brown St. (Issie had worked at Stetson, where he was injured in an elevator accident.) "Shuster the butcher" from Woodland Ave. delivered kosher meat for the family to his friend Maurice, whom he called "Moishele". Later, Maurice bought the building at a sheriff's sale, for cash, rather than lose the store. Gloria remembers that Maurice took his family for summer vacation to a nearby boarding house on States Ave, run by Mrs. Barret. Mrs Barret's daughter Sarah limped badly, the result of attempting suicide by jumping out the window because her family objected to her boyfriend. Sarah's custom was to leave her two children in the morning to get them some milk and cake for breakfast, and sandwich makings to take to the beach. While she was out, she would sit down for her own breakfast. Each night they would go out for dinner, and Gloria would fall asleep at the table. Much later, Maurice bought a black Pontiac, also for cash, and Sarah's brother Lou taught Bob how to drive. 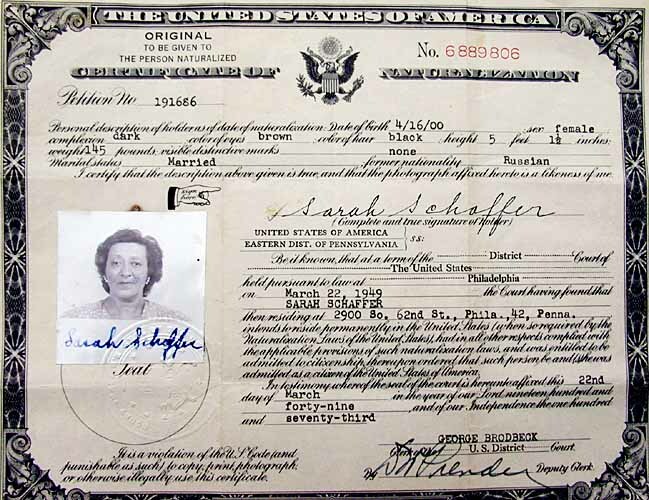 Sarah became a citizen on March 22, 1949.
her weight at 145 pounds. On November 20th 1950, Sarah told Maurice to close the store early, (his usual hours were 6 am to 11 pm) since there were lots of orders in the store, ready for Thanksgiving. She was only preparing a plain dinner of hot dogs, because she was busy baking strudel. Maurice came up the stairs from the store complaining of not feeling well. He went upstairs to lie down, but came down shortly for Alka Seltzer. He sat down on the couch and presently keeled over - and died without a doctor. Bob was 18, Gloria was 14. He died without a will. 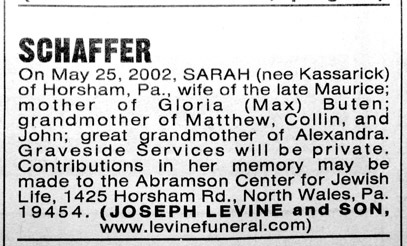 Lou Kassarich, Sarah's younger brother, handled the estate; Gloria inherited $800. Sarah's mother had a stroke on hearing the news and died two weeks later. Bob took over the store and the family, keeping the store open (and keeping himself out of the army as sole support for his family) till he graduated from law school. In contrast, when Gloria later worked at Central-Penn National Bank and elsewhere, she used her earnings to buy nice clothes. After Maurice died, Artie the milkman came courting Sarah, dressed up in a green shirt. He became friendly with Bob, but didn't get anywhere with Sarah. Sarah lived on 62nd St. until 1988 (or maybe 1989), when she fell and broke her hip. The hip was pinned and then, when the pins didn't hold, replaced. After rehabilitation at Moss Hospital and in Bryn Mawr, she moved to York House, then the Philadelphia Geriatric Center next door, then the Abramson Center in North Wales PA, where she died on May 25, 2002. Sarah's crowd at 29th and Dauphin included Dorothy Goldman, Rose Rosoff, Helen and Sarah Greenfield. They went to dances in suits that they bought from a tailor at 16th & Ridge. 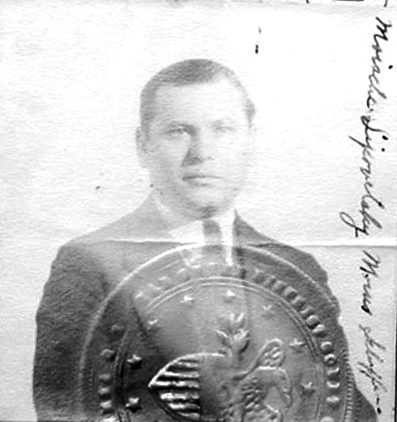 Rose Rosoff's husband, Buschel, is Murray Saltzman's uncle. Much later, Rose lived at 2601 Parkway, while Sarah Greenfield lived at Park Towne Place. Sarah is at the top of this photo. Gloria: Hinda, after Sarah's grandmother. John: Itzhak, after Is Buten, Max's father's oldest brother. Sarah's Rabbi at PGC and at her funeral was Shiela Segal. Her doctor was Susan Denman.